Klein-Aus Vista Desert Horse Campsite offers ten basic campsites, set under large old camelthorn trees in a small valley of the Aus Mountains, surrounded by granite outcrops. 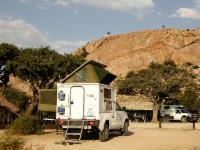 The camps are ideal for travellers exploring the region or travelling to and from Luderitz. The campsite boasts a clean and well equipped space with braai facilities, running water, a picnic table with benches, and a windbreak. Flush toilets and hot-water showers are available at the communal ablution block. There is no electrical point, but guests can charge their equipment at the Dune Horse Inn reception, only three kilometres away. The surrounding area offers a selection of hiking trails to explore. For those who need some luxury the Dune Horse Inn has a swimming pool, restaurant and bar, and Wi-Fi access. The Inn has a restaurant where guest can enjoy meals or arrange braai packs. Family friendly: We offer great family fun such as mountain biking, hiking, as well as horse riding. The campsite facilities were good and the views were lovely. We had a very good dinner in the restaurant. It was an excellent stopover as we could get to Kolmanskop in time for the 9.30 morning tour. We loved the lovely views and clean ablutions, the campsite with trees and the quiet surrounds with views all round. Loved the location, hiking, mountain biking. Really beautiful and the campsites were perfectly maintained. Eagles Nest accomodation out of the books, love the campsite, will be back for the hiking trails. Klein-Aus Vista Desert Horse Campsite is 6.6km from the centre of Aus , the nearest airport 208.8km (Keetmanshoop Airport).